Endeavor Plumbing is proud to extend its services to the residents of Hawthorn. As an essential part of our everyday lives, it is imperative that plumbing appliances and devices are functioning properly at all times. The Endeavor Plumbing team is committed to make sure that whenever any plumbing issues arise, our clients have a prompt and timely solution. Our client base varies from residential, to commercial, and from large to small establishments; no matter the size or type of setting, we are the adequate team for the job at hand. Plumbing tasks often include repairs of appliances, but our services go far beyond basic repairs. We provide assistance with inspections, devices such as hot water systems, water recycling, renovations, and much more.. Assisting our customers effectively is a top priority in our trade. We want to make sure all of our clients are satisfied with the labour performed by our team. We strive to be the most dependable plumbing team in Hawthorn, making ourselves available at a moment’s notice and also giving our customers the guarantee that all services will be performed by well trained professionals who they can rely on for all their plumbing requirements. Our team places a great deal of importance on being professional through and through, always treating our customers with respect, honesty, and integrity. With our many years of experience in the plumbing industry, there is no doubt that we have a group of knowledgeable and qualified experts who know how to handle all kinds of plumbing situations. 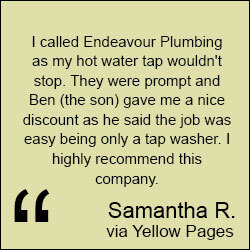 With Endeavor Plumbing, our Hawthorn customers can expect the highest quality service for the best value. We also provide plumbing services in Metro and surrounding suburbs such as our plumbing services in Burwood, if you're looking for the quickest service speak to our expert plumbers today.